Bed Bug Exterminator Seattle: The Differences Between Bed Bugs, Fleas, Scabies, and Chiggers. Bed bugs can give even the toughest man the shivers. To think about these little bugs crawling around and hiding in corners of the bed, in clothes, in places you wouldn’t imagine, is very unpleasant. Dealing with any variety of bug in the home is a nuisance. A homeowner or apartment renter may go straight to bed bug when the tell-tale signs show up, bites. Not that this is good news, but keep in mind, that other small bugs also bite. How do you tell the difference? Read through how to tell the difference between bed bugs, fleas, scabies, and chiggers. If you determine that bed bugs are lurking in your home, call the professional bed bug exterminators at Northwest K9 Bed Bug Detectives. Typically, people react differently to bites from either bed bugs or fleas and both generally cause red, itchy bumps to form on the surface of the skin. Fleas tend to bite around the ankles or lower legs. Fleas can often be found on pets, so if you find evidence of bugs, search your cat or dog first. Fleas can move easily from a pet to a human. Bed bugs, from the name, are generally found in the corners of a bed but are also found in upholstered furniture, along baseboards, floors, and carpeting. One more way to possibly determine which bug is in your home is to look at feces. Fleas leave behind feces that are reddish-black, and when mixed with larvae, it has a salt and pepper look. Bed bug droppings are similar but have more of a black speckling look. Bed bugs also shed their skins which have a light brown color. 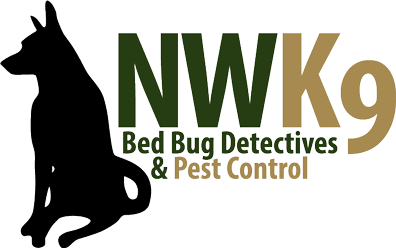 The only way to know for sure what type of bug is in your home is to call for a bed bug inspection by Northwest K9 Bed Bug Detectives. You may feel your skin crawling already. Scabies aren’t bugs at all, but microscopic parasites that penetrate your skin to feed and lay eggs. Bed bug bites are red bumps or welts on your skin. When scabies burrow into the skin, it shows up as grayish-white, raised lines, and eventually turn into red and inflamed bumps called papules. At this point, bed bugs look similar to scabies. Without treatment, scabies can turn to skin lesions and large patches will cover your body. Bed bugs typically bite skin that is exposed while sleeping, around the arms, shoulders, and face. Scabies generally prefer to dig in warm folds of the skin, in fingers, toes, and armpits. Bed bugs, scabies, and chiggers all form a similar shape and size on the skin when they reach a certain point. A small, circular, itchy red bump on your skin is a sign of any of these bugs/parasites. Chiggers, unlike beg bugs or scabies, usually show up after you have been in the woods or in a field without socks or just shorts that leaves the skin exposed. The pattern between bed bugs and chiggers is also different. Bed bugs tend to bite in a line or in groups of three, chiggers will bite in random parts all over your body but will be focused on your legs. Chiggers will stay on your body and can move into your home and spread around. No matter what type of bug or parasite is in your home, you want it out as soon as possible. The only way to know for sure what is infecting your home is to call a professional. Northwest K9 Bed Bug Detectives are experts at finding and treating bed bugs, finding bed bugs with the help of canines as well. From the first sign of bed bugs in your home, contact us and you can be sure to feel comfortable in your home again.